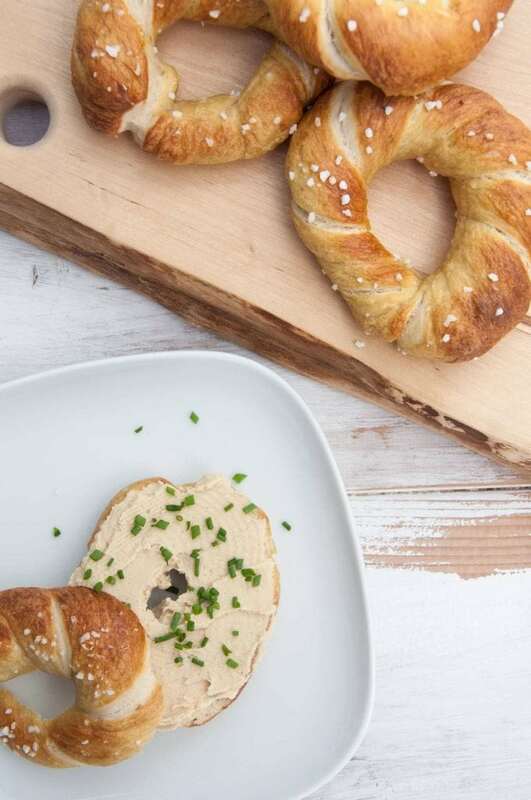 Can’t decide between pretzels and bagels? You don’t have to! 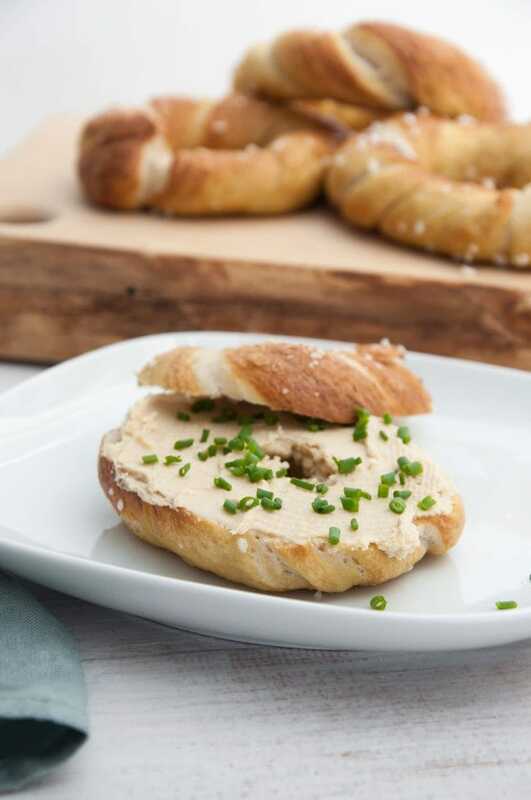 These Twisted Pretzel Bagels are so soft and fluffy! They are topped with pretzel salt. If you want to make something special for a weekend brunch, then these are perfect for it! Lately, many introduction texts here on Elephantastic Vegan start with ‘can’t decide between … and … ?’. That’s how recipes like Banana Bread Pancakes and Pretzel Garlic Knots come to life. But seriously, aren’t these the best ones? That combine two amazing recipes into one? I think so! The same is true for these Twisted Pretzel Bagels. Bagels are cool, yo. Anything pretzel-style is super yum. And then the twisted style – I’m in love with this recipe! Of course, they are topped with coarse pretzel salt – it’s almost the most important thing. Here’s a step-by-step photo instruction on how to make Twisted Pretzel Bagels: 1) Form a long rope (12 inch/30cm) and pick it up in the middle. 2) Twist the two sides. 3) Pinch together the edges so it’s a Twisted Bagel! To give the bagels a pretzel coating, I’ve cooked them in a baking soda bath before baking. 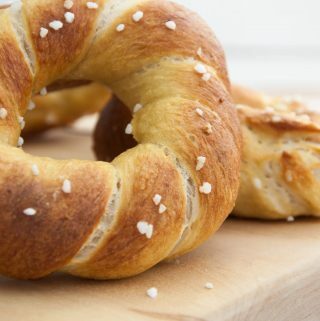 This adds not only the beautiful brown pretzel color (they’ll turn brown while baking) but also the typical pretzel taste! I’ve tried lots of different water to baking soda ratios and found that 1 1/2 tablespoons baking soda to 3 cups of water is ideal. If you use too much baking soda, the pretzel bagels get very bitter. 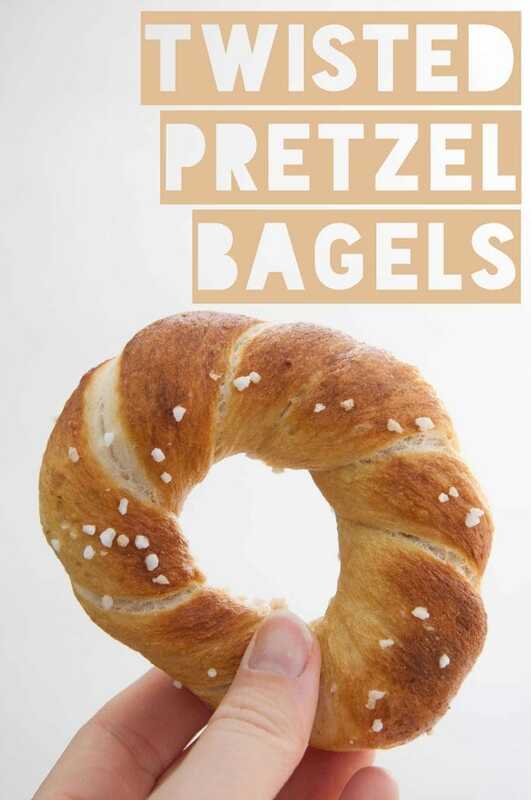 Can't decide between pretzels and bagels? You don't have to! These Twisted Pretzel Bagels are so soft and fluffy! They are topped with pretzel salt. If you want to make something special for a weekend brunch, then these are perfect for it! Combine the flour, instant yeast, and salt in a mixing bowl. Add olive oil and water. Mix and knead by hand until a soft dough forms or put all the ingredients in a kitchen machine and let the machine knead the dough for you. Finetune the dough: If it's too sticky, add more flour. If it's too crumbly, add more water. Coat the ball of dough in a drizzle of olive oil. Cover the bowl with a clean kitchen towel and let the dough rest in a warm spot until it doubles in size (about 2-3 hours - depending on the room temperature!). 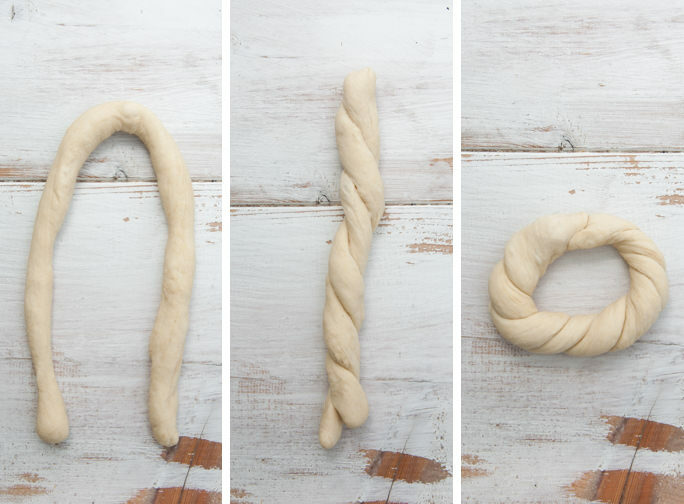 Divide the dough into 4 equal parts, roll each part into a very long rope (about 12 inches / 30cm), pick it up in the middle, twist the two sides and pinch together the edges so it's a bagel shape. In a medium-sized pot, bring the water for the baking soda bath to a boil. Add the baking soda. Stir to combine. 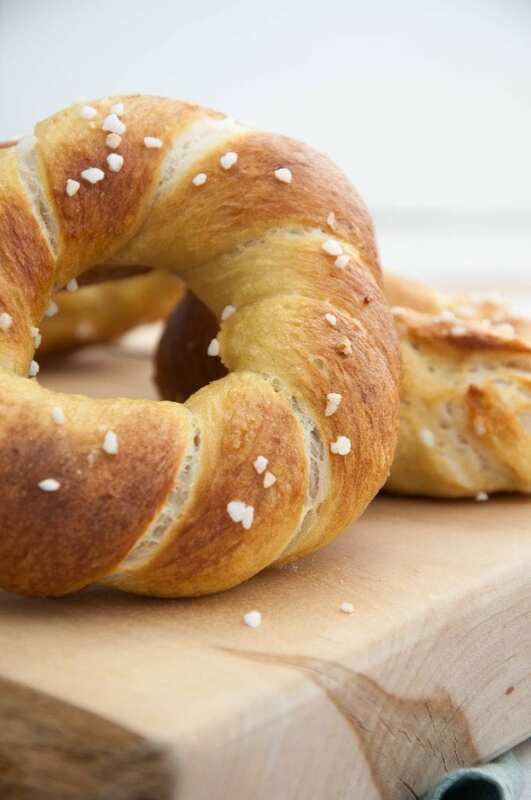 Cook each pretzel bagel in the baking soda bath for about one minute. Transfer them to a baking tray lined with parchment paper. Immediately sprinkle them with the pretzel salt. Bake them in the oven for about 20 minutes until golden. And enjoy!